What Causes Headache in Left Temple? Over 70% of the world’s population suffers from headaches. A headache in left temple can indicate many different things, although you may be a little nervous to go to the doctor. It is important to understand that while it may just be a common headache, left temple pain is also very easy to over-medicate with pain relievers if it is chronic. This can lead to other problems, such as stomach disorders, damage to the liver, decreased kidney function or an allergic reaction. Constant pain in left temple needs to be evaluated to make sure it is not a symptom of something more severe and help you find a medication that will help. This type of headache is cause by the inflammatory temporal artery. You may have a headache in left temple or even the right temple area, tender skin, jaw pain and trouble chewing. Some people even complain of a stiff neck and shoulders. It is treated with steroids to decrease the inflammation. Cluster headaches are actually pretty rare, but people who suffer from them know they are one of the worst headaches you can have. The pain is very severe, the eyes water and nose runs. This pain happens daily for a number of weeks and then goes away for up to a year. 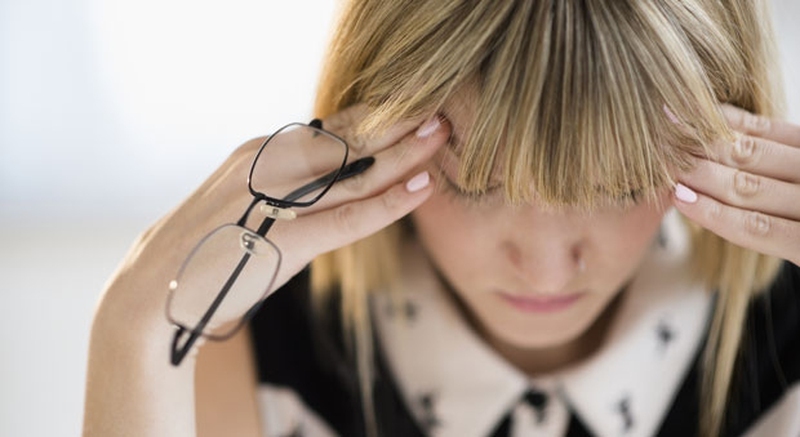 Tension headaches are the most common type of headache. They give a sensation of tightness in the muscles of the head and neck and tend to “band” in an area of the head. There are no other symptoms and usually are not associated with anything serious. Migraine headaches occur in 15% of women and 6% of males. They are usually preceded by an “aura” or you can feel when one is coming on. There is sensitivity to light and sound. Nausea and vomiting may happen. Migraines usually have a trigger, including hormonal changes, sulfites (wine) or high stress levels. This type of headache may cause headache in left temple or right temple and may be caused by a neck issue. They are not as painful as a migraine, but can be very painful. It may start in the eye or the ear and feel like a “band” is running through one side of the head. It worsens after sleep due to the neck being held in a bad sleeping position. This severe and sharp pain feels like being stabbed in one or both of the temples. Another common area for this pain is right in the eye. This sensation is also associated with migraines or cluster type headaches. This is actually a very rare type of headache that causes a "coin-shaped" stabbing sensation only on one side of the head. They are called "coin-shaped" because the pain only occurs in a 2 cm to 6 cm circle area. They happen most often in women and can be chronic lasting for weeks to months. These are a short-term, one-sided type of neuralgia (nerve pain) headache most commonly experienced by men over the age of 50. They tend to come in bursts that feel like burning, stabbing or throbbing near the temple area or the eyes. They happen most often in the daytime hours and last a few seconds or minutes. They also can re-occur many times within the same hour. This is a very serious form of headache due to the carotid artery to the brain rupturing or tearing. The onset has “the worst headache” ever felt, a dropping eyelid and sometimes symptoms that are like a stroke. This includes vision problems, slurred speech and weakness. This is because the dissection reduces the flow of blood to the head. The pain can occur in the temples or the forehead area. The pain usually happens suddenly and it is a medical emergency. So if you feel this pain or have other symptoms, call 911. This is a headache that does not go away. It is a rare occurrence and only felt in one spot on the head or facial area. They can be dull pain or sever pain. Sometimes there are stabs, sharp pains or jolts. They can occur up to 5 times daily and be ongoing for months to even years. The junction of the jaw can radiate pain into the temples if there is a dysfunction. One of the commonly known disorders is TMJ and happens when the joint is not aligned properly. There are certain foods that can cause headaches. These are foods that are high in either sulfites, nitrites, or monosodium glutamate and the headache occurs as a reaction. Other symptoms include sweating, trouble breathing, and tension. It comes on within 30 minutes of eating foods containing these preservatives. These include wines, processed luncheon meats/hot dogs, Chinese food, some spices and seasonings, and processed canned goods. Chocolate can also be a headache trigger for some people. Server responsed at: 04/25/2019 2:41 a.m.